I've been away from the blog for a few days because of poor Internet and lack of time, my apologies. I'm writing this morning from a cozy room at Old Faithful Snow Lodge in the Upper Geyser Basin. The weather outside is certainly warmer than my last trip with highs in the high 20s. We've had loads of new snow this week and wind creating a ground blizzard preventing us from going through Hayden Valley. By wind I mean the kind that blows up sharp snow crystals stinging your face and creating wideouts where it's difficult to tell where the ground ends in the sky begins. This is just one of the many experiences of Yellowstone and we are certainly enjoying our time here. I try to make at least one snow angel per trip. Sometimes the entire group will layout snow angels in a line, 15 or 16 long. This day it was just me. We did get a glimpse of the sun shining off Mammoth terraces. Here's the National Geographic Expert Kitty Coley braving the snow the Grand Canyon the Yellowstone. 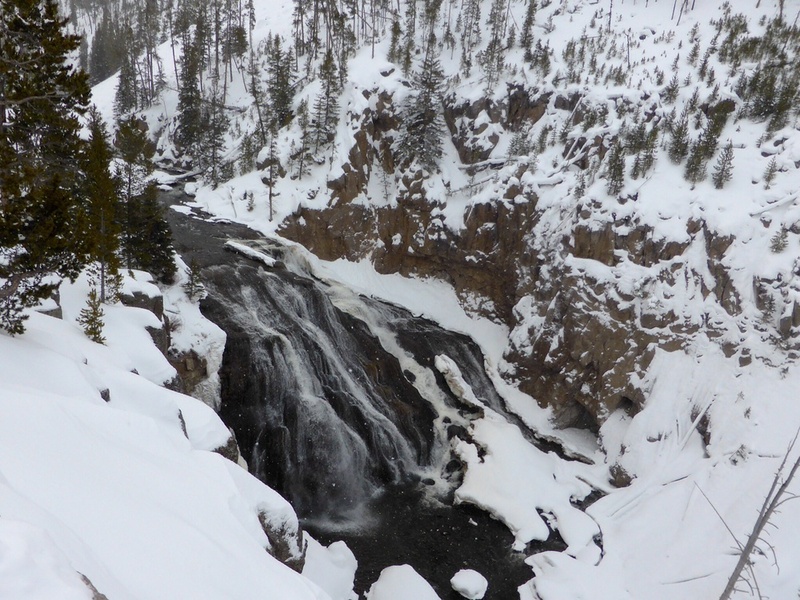 Here is Gibbon Falls on the Gibbon River. A location we normally don't get to see, however, getting turned back in Hayden Valley allowed us to catch this feature, Beryl Spring and a couple of others we normally don't see on National Geographic's tour of Yellowstone National Park.